Stability in the country sure to boom tourism/ economy: Vice Prez. KATHMANDU, April 29: Vice President Nanda Bahadur Pun suggested all political parties to make the sustainable economic development an agenda in upcoming election which also will boom the tourism of Nepal. 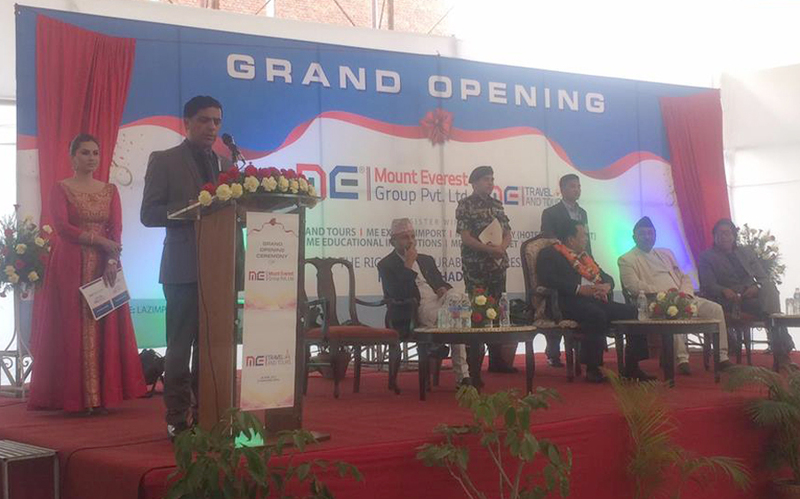 While inaugurating a travels and tours agency operated by the Mount Everest Group Pvt. Limited, the Vice President said an atmosphere favorable for investment was being created in the country along with an assurance of security through political stability. Also speaking on the occasion, former Chairman of Council of Ministers Khil Raj Regmi spoke of the need of creating employment opportunities at home and increasing investment in productive sector. Organisation chair Kamal Raj Adhikari said the objective of the establishment of the agency is to utilise skill, knowledge and income earned by the non-resident Nepalis in motherland. Organisation Nepal representative Yubraj Parajuli shared that they had aimed at providing employment to 5,000 youth within the next eight years. The organisation has the investment of non-resident Nepalis residing in 42 countries.